Third in a series of interviews with poets to be featured at Split This Rock Poetry Festival: Poems of Provocation & Witness, April 14-17, 2016. Pre-registration available until March 31 at Split This Rock's website. 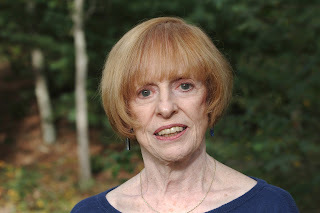 Martha Collins is one of the poets we are honored to feature at Split This Rock Poetry Festival: Poems of Provocation & Witness 2016, April 14-17, 2016. Martha Collins’s eighth book of poetry, Admit One: An American Scrapbook (Pittsburgh, 2016), follows White Papers (2012) and the book-length poem Blue Front (2006) in combining careful research with innovative poetic techniques to explore disturbing aspects of America’s history, including race and racism. Described by the AWP Chronicle as “a dazzling poet whose poetry is poised at the juncture between the lyric and ethics,” Collins has also published four collections of co-translated Vietnamese poetry and (among other books of poetry) Day Unto Day, a 2014 collection of “calendar” poems. Her awards include fellowships from the NEA, the Bunting Institute, and the Siena Art Institute, as well as three Pushcart Prizes, a 2013 Best American Poetry award, and an Anisfield-Wolf Award. Founder of the creative writing program at UMass-Boston, she served as Pauline Delaney Professor of Creative Writing at Oberlin College for ten years and as Distinguished Visiting Writer at Cornell University in 2010. She is currently editor-at-large for FIELD magazine and one of the editors of the Oberlin College Press. She lives in Cambridge, Massachusetts. To learn more about Collins, visit her website: marthacollinspoet.com. Tiana Trutna (TT): What inspired your commitment to write about race issues? Martha Collins (MC): I wrote several poems that focused on race in the 1990s, but it wasn’t until I saw an exhibit of lynching postcards in 2000 that race began to be central to my thinking, living, and writing. The postcards were shocking in themselves, not least because they were sent to friends and relatives or saved as souvenirs; but what stunned me most was realizing that the hanging my father told me he’d seen as a kid in southern Illinois was actually a lynching witnessed by 10,000 people, its primary victim—predictably—a Black man. I spent several years researching and writing Blue Front, a book-length poem that focuses on the lynching. But the more I wrote, the more I began to ponder what this had to do with me, a white woman living almost 100 years later. That led to White Papers, which, like the earlier book, includes a great deal of research, in this case into the history of race and racism in the Midwest (where I grew up) and New England (where I live), as well as more personal poems about my own privileged white life. TT: The current climate of high-profile murders of black and brown lives has brought the deeply-embedded realities of racism to mainstream media and our society’s general conscientiousness. Do these stories trigger and influence your poetry? MC: Although I wrote a poem dedicated to Trayvon Martin just after the Zimmerman verdict, it usually takes awhile for events or other stimuli to make their way into my poetry: I pondered that lynching for almost a year before I began to write about it. But I just finished the last of twelve month-long poems for which I wrote several lines a day on each day of a given month, at the rate of one per year; the first six were published in 2014 as Day Unto Day. Although it wasn’t my intent when I began, issues like these began to make their way into the poems, and became dominant in the last one, which was written in November 2015 and will appear in the Split This Rock issue of Poetry magazine. TT: When did you first start thinking about language as a means for social change? MC: I have always thought about language—or maybe “lived consciously in language” is a better way of saying it: even my child-brain enjoyed playing with words. And I first began to think seriously about social change during the Vietnam War, which was also when I began, tentatively, to write poems. But it took me awhile to realize that poetry would be central to my life, and it wasn’t until the 1990s, when I began working with the William Joiner Institute for the Study of War and Social Consequences, that my political and poetic lives came inseparably together. TT: What audience(s) do you keep in mind when you write and publish your poetry? I don’t think about audience at all when I’m writing: thinking about audience can lead, for me, to self-censorship, which can be thoroughly paralyzing. I do think about audience when I consider publication, but only in the sense of trying to make sure that whatever I’ve written will not in some way offend or hurt people I have no intention of offending or hurting. TT: In an interview for Coal Hill Review with Michael Simms in 2012, you said, “I’ve learned that I have to push past the a whole army of mental censors (based on parents, teachers, critics, the culture at large) that tell me I cannot / should not / must not write what I’m writing, whether for aesthetic or moral or some other reasons. It took me awhile, but I finally learned that I’m usually onto something when I hear the censor’s voice.” Can you tell us when you first came to this realization, and how it has influenced your writing sense? MC: I realized this a long time ago, when I was writing obliquely personal poems. The mental censors in that case were my parents, and my first solution to the problem was to not try to publish my poems at all. But I’ve also experienced aesthetic self-censorship (is that really a poem? )—and when I realized I was going to write about that lynching, it hit me with full force (is it really okay to a whole book about a lynching, especially as a white person?). By that time, I had learned to “listen” to the censors, who by now have a place in my brain which I can almost physically locate. When the censors say No, I say Aha! and keep writing. TT: Your reading from White Papers as a featured poet at Split This Rock 2010 was one of your first public readings from the book. Can you tell us little about that reading and the impact it had on your writing and/or view of poetry as activism? MC: Giving the reading was fabulous in itself: have I ever had a better audience? But the most inspiring thing about that festival (as well as the ones in 2012 and 2014) was being part of a community of like-minded folks—and such a wonderfully diverse community too, in every sense (including the aesthetic) of the word. TT: You have now written a trilogy (White Papers, Blue Front, and Admit One: An American Scrapbook). Did you intend to write a trilogy and if so, how did it come about? MC: Somewhere around 2010, I gave a reading in San Diego, which included both Blue Front and the unpublished White Papers. Afterwards, Ilya Kaminsky (thank you, Ilya!) said something to the effect of: You realize you’re writing a trilogy, don’t you? Well, uh, no—and it took me awhile to realize that the stammerings-on-paper I’d made about the 1904 Worlds Fair were going to lead to another book-length project. The new book is more broadly about race than the other two: it focuses on the eugenics movement, which narrowed the conception of racial superiority and targeted “mental defectives” and immigrants as well as people of color. But I was definitely aware of the trilogy idea as the book began to take shape. TT: How has your experience as professor of creative writing at University of Massachusetts-Boston and Oberlin influenced your writing, if at all? And how do you feel teaching connects to the process and product of your poetry and community building? MC: Teaching at U.Mass-Boston was a politically and socially educational experience for me. U.Mass has a large percentage of working-class (and working!) students, and was more racially diverse than any place I’d known; these demographics led me to explore and teach more diverse literature than I’d studied in school, and to interact with a more diverse group of people. Teaching also helped nudge me toward writing poetry in a serious way: the more I taught, the more I realized I wanted to be a writer, not a critic who wrote about writers. Since then, I’ve appreciated my teaching affiliations as a way of extending my work into a community of writers and would-be writers. Writing is a lonely activity; teaching writing is something else. TT: Does your role as a translator of Vietnamese poetry influence and/or affect your writing? And do you see any commonalities in themes? MC: When I began translating Vietnamese poetry, I was amazed to think that working on poems could in itself be social activism, in this case as a kind of reparation for the Vietnam War that would bring the work and vision of our former “enemies” to the attention of an American audience. I hadn’t yet thought of my own poetry in that way, but I soon began to do so. It took me awhile to realize that one effect of translating poetry has been to give me a model for the research work I’ve done for my recent books: making a document or a newspaper article into a poem is, I think, not unrelated to the process of translating poetry. It’s also been important to become immersed in a language that is so different from European languages that it shakes up one’s sense of how language “works.” I’m not quite sure how that awareness has affected my poems, though I imagine it has. I’m not sure about themes, either: maybe somebody else could find some commonalities there. TT: What are you working on now? MC: This interview! Seriously: I finished the last of those month-long poems in November, which means that I’ve finished another book; what I’ll write next in the poetry department is not at all clear to me. I’m finishing up several prose pieces, as well as a couple of anthologies—one a collection of multiple translations of poems I’m co-editing with Kevin Prufer, the other an anthology of essays about the poetry of the late Jane Cooper. I’m also working, with Nguyen Ba Chung, on another book of co-translations of Vietnamese poems, this one by Tue Sy, a Buddhist monk. But poetry? Nothing yet except—well, we’ll see. Tiana Trutna is Split This Rock's part-time Administrative Assistant. As a graduate student in a Masters in Library and Information Sciences program, Tiana is passionate about the power of literature and spoken word to empower individuals and build bridges between communities. She also loves reading in the park with a sky full of big puffy clouds and a slice of homemade blackberry pie.